ndd's EasyOne product family is a truly simple and easy-to-use product line that makes lung function testing faster, simpler and more reliable. The EasyOnePro is the first product that applies ndd "TrueFlow", "MolMass" and "UPG" simultaneously. - No bags, fast gas without valve contact, light weight (120 - 300 gr), ergonomic design. - State of the art connectivity for easy communication quick and secure set up at visiting locations. - On site upgrades and software changes by memory sticks. - Highly portable, self contained, instant point of care/bedside use, no warm up time. - Easy to maintain. “2-in-1” tube needs no maintenance, cleaning is possible, a yearly exchange is recommended. - The 3 components are totally interchangeable and replaceable. - The whole patient interface unit can be replaced without any need for calibration or adjustments - DLCO gas (He 10 %, CO 0.3 %) can be locally provided in bottles of different sizes allowing for specific needs. - Dimensions: 27 H x 33.5 W x 27 D cm. 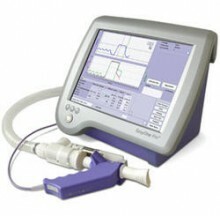 Click the button below to add the ndd EasyOnePro Portable Spirometer to your wish list.